Lord's Art Catholic Art pieces are classical and timeless pieces of Catholic artwork that reflect the devotion, history, and tradition of Catholicism. We carry the work of renown modern artists such as Warner Sallman, Albrecht Durer, Octavio Ocampo, Jason Jenicke and Venetia Epler as well as the old Masters such as Raphael, William Adolphe Bouguereau, Roberto Ferruzzi, Andrea Solario and others. Whether you are looking for Catholic art prints of Jesus, Mary, the Annunciation, Pieta, the Nativity and more, LordsArt.com is the place to find Holy Family artwork. 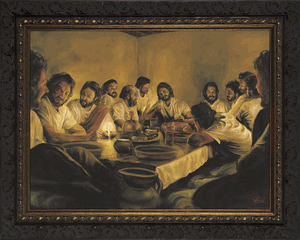 From simple wall art & home décor to fine art giclées, shop LordsArt.com for Christ-centered art and wall décor that will enhance the beauty of any office or home. Whether you’re buying Catholic artwork for yourself or giving it as a gift, you will love these reminders of God's goodness and unfailing love. Catholic art prints are a great way to share your faith and anyone who receives it will treasure it.